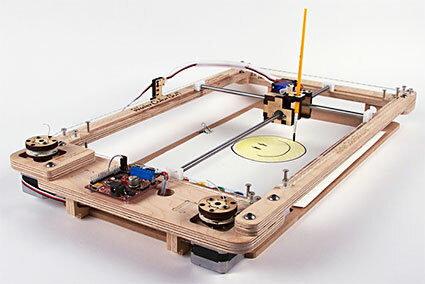 A modern-day Etch-A-Sketch for robotic enthusiasts! Super Awesome Sylvia's WaterColorBot by Evil Mad Scientist Laboratories is a great friendly and educational path to enjoying art with robotics! Painting with watercolors, the WaterColorBot is now on Kickstarter and can use vector artwork from your computer or follow your movements as you sketch in real time. With the aid of robotics, the unit dips its brush in water, then goes and gets the right color of paint. The WaterColorBot works with standard watercolor paints and paper, so you never need to purchase specialized or expensive supplies. Made in the USA, the very sturdy wooden frame will give virtually a lifetime of enjoyment. Other parts are sourced from good quality vendors and should provide many years of use before needing to be repaired. 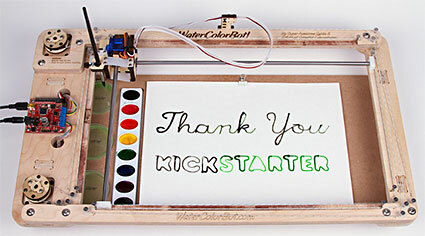 WaterColorBot is basically a pen plotter that uses a set of watercolors, thus the basic technology is well-sorted. The WaterColorBot computer-automated, numerically controlled (CNC) machine provides users to do a variety of things. One of these include once your drawing is stored in the computer, you can copy it as many times as you like with digital precision. Thus the results is that each one being a virtual 'original'. To move the paint brush, there are two motors built into the frame of the robot. Each motor drives a little winch that moves a length of cord attached to a rod that controls either the X or Y position of the brush. For those of us who may recall the Etch-A-Sketch from our youth, this same mechanism can be found inside many vintage plotters and chart recorders plus is the same mechanism that an Etch-a-Sketch uses. Of course instead of a stylus, Evil Mad Scientist Laboratories' product uses a carriage that moves the brush up and down. 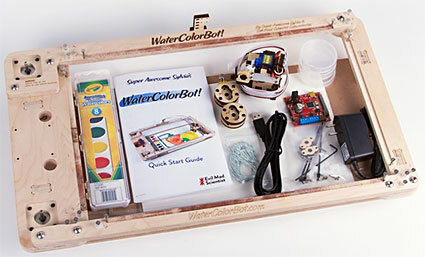 To quote the company, "The WaterColorBot comes as a kit, with some assembly required. The major components (chassis, carriage, and motor controller board) come pre-assembled. It also comes with a starter set of watercolor paints, paper, and a brush... You will need a recent-vintage computer (say, made within the last five years) with an available USB port. You will also need internet access to download software, instructions, and (optional) instructional videos. To put the kit together, you'll need small and medium Phillips-head screwdrivers, and a sharp pair of scissors. Pre-teen and younger kids will need adult help to put it together and get started using it."